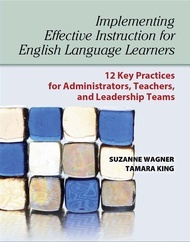 Suzanne Wagner, Ph.D., has been a bilingual educator for more than 30 years. She has taught English as a second language, worked as a high school bilingual coordinator, and as a Title VII program director. As a specialist at the Illinois Resource Center in Arlington Heights, Wagner has taught courses, conducted workshops, and provided professional development for teachers and administrators in school districts throughout Illinois and nationwide. Tamara (Tammy) King, M.A., is an education specialist at the Illinois Resource Center in Arlington Heights where she focuses on program design and improvement—especially in multilingual settings and districts with small numbers of English language learners. Bilingual in Spanish, she has worked as an elementary bilingual and English as a second language (ESL) teacher, an adult ESL teacher, and a language education program coordinator in a large, linguistically diverse school district. King is a WIDA-certified trainer and writes for the WIDA blog. She is also a wife and the mother of a precocious toddler.